Room to relax. Imagine a spacious mountain house in the heart of the city. 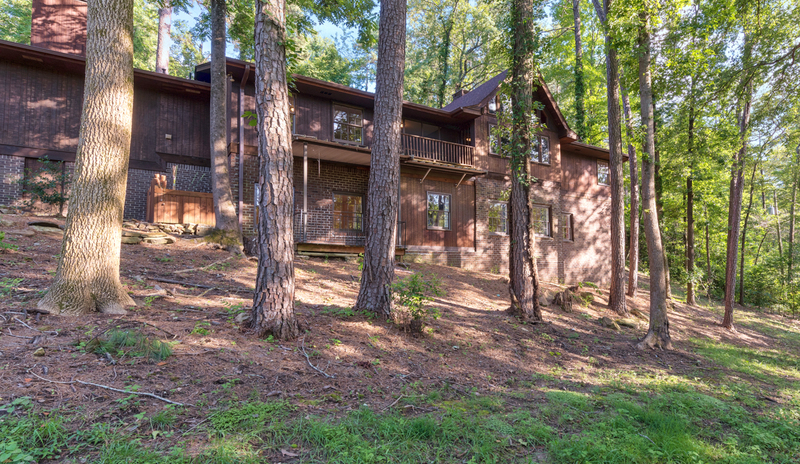 Nestled into 1.8 wooded acres on prestigious Pump House Road in Mountain Brook, this rustic 5-bedroom, 5-bath home boasts 3 working fireplaces. The soaring ceilings and walls of windows let in tons of natural light and views of the shady green trees covering the property. The main floor features gleaming hardwoods, wood paneled walls and ceilings and an exposed brick fireplace. Custom built-ins, paneled doors and neutral paint and carpet add to the charm. The large, open kitchen features double ovens for entertaining, stainless appliances, tons of cabinet space and a built-in desk. The bedrooms are very large and the basement apartment features its own kitchenette and fireplace. Multiple decks and patios lead to woodsy views of this unexpected oasis on the corner of 280 and Rocky Ridge Rd. This amazing home offers the space your family needs in the school system you want. Take your time updating it or start now and it could be ready by the time school starts in the fall. Don’t miss the opportunity to breathe deeply on almost 2 acres at the intersection of Vestavia, Mountain Brook, and Cahaba Heights. And don’t forget that Brooks Hall has the design expertise and connections to help you make this house your forever home. View full listing details here. For more information or to schedule a showing, give us a call at 205-903-8052.